The father of a Belgian footballer who died following a cardiac arrest has thanked his club for staging a tribute to the 23-year-old. 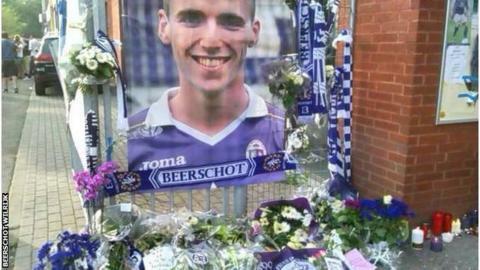 Over 2,000 people attended a service for Tim Nicot at Wilrijk-Beerschot's stadium on Monday, many laying flowers and signing a book of condolence. "This is overwhelming," said Alain Nicot. "Tim was incredibly proud that he played for this club." Nicot was playing in a tournament in Hemiksem when he collapsed on Saturday. The defender was placed in an induced coma and his club confirmed his death on Monday. Nicot's parents and siblings along with players, staff and academy youngsters from the fourth-tier club also joined the mourning at the Olympic Stadium in Antwerp. "The whole Wilrijk-Beerschot football family has shown how special our son was for them," Alain Nicot added. "That gives us a good feeling between all the pain and grief." Wilrijk-Beerschot captain Davy De Smedt said: "I have never before seen anything like it. It's unreal and difficult to accept this loss. "The huge turnout of supporters here does everyone good. It proves what an important place Tim Nicot took in our group and how incredibly popular he was with the fans." Nicot is the second Belgian player to die of cardiac arrest in the past two weeks. In late April, Lokeren defender Gregory Mertens, 24, died after collapsing during a reserve game.